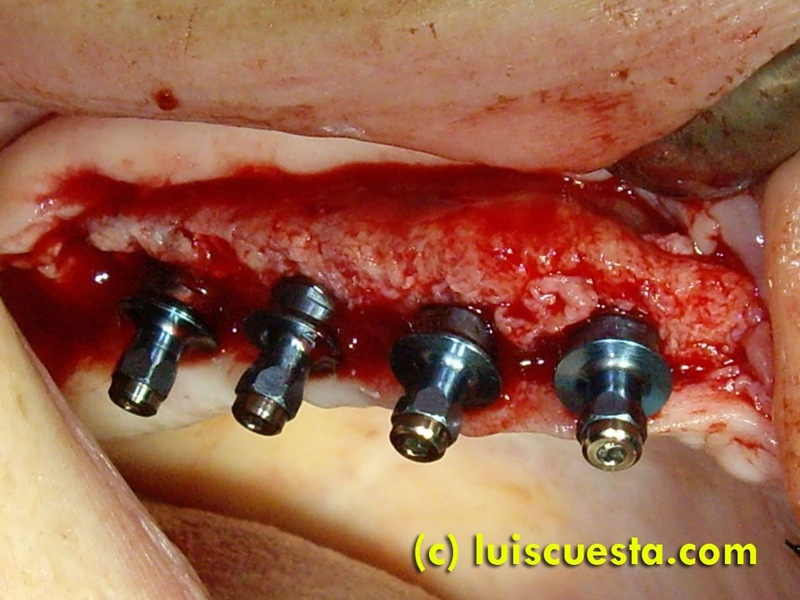 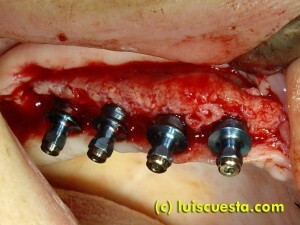 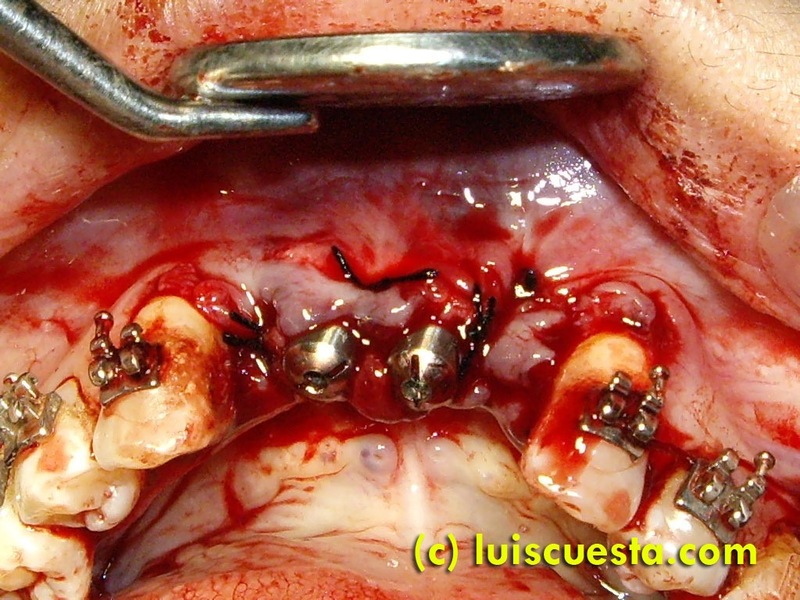 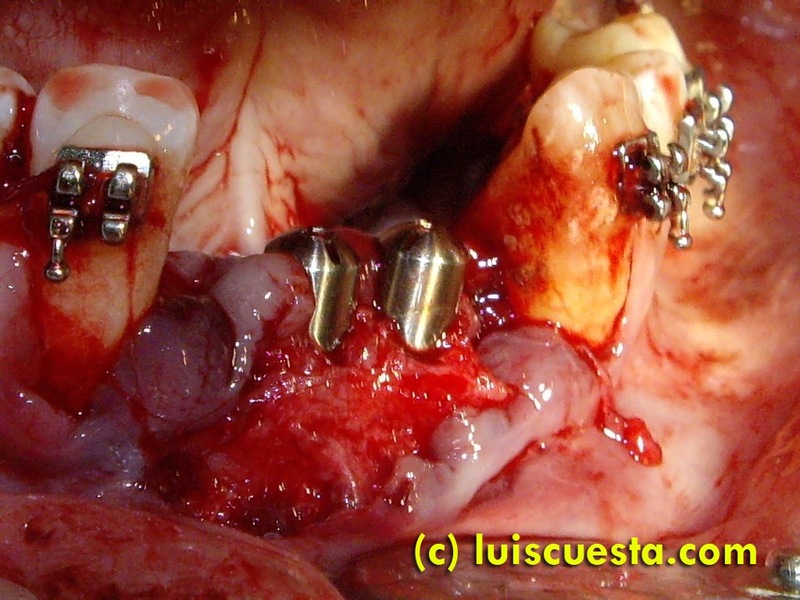 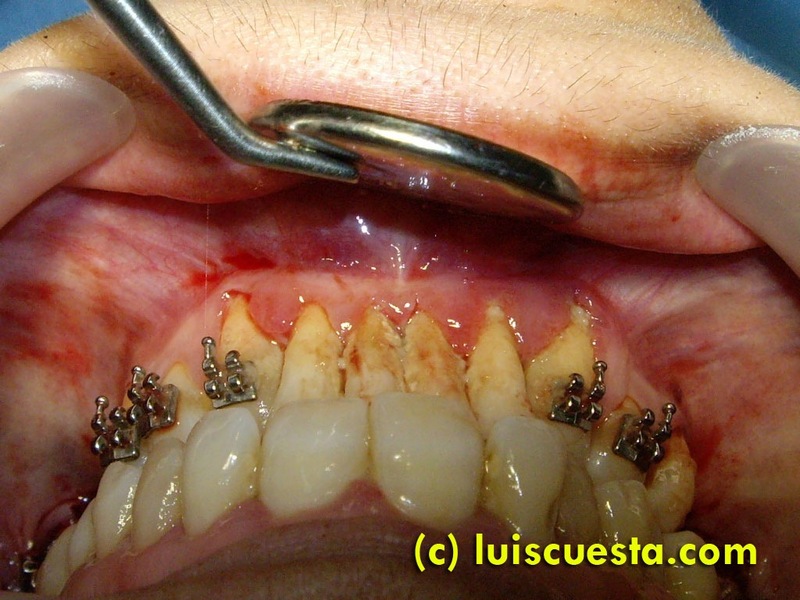 Delayed implants after total extractions. 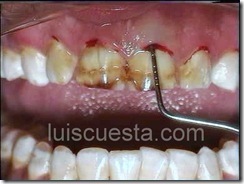 Periodontal disease. 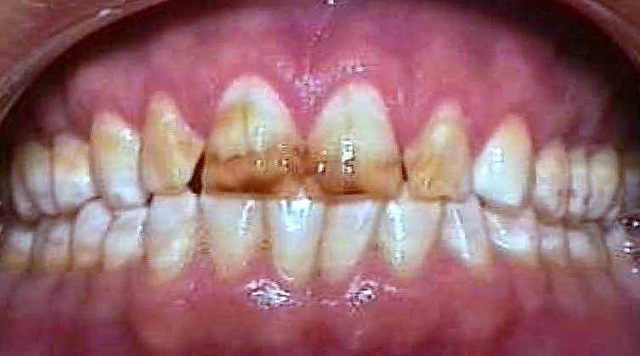 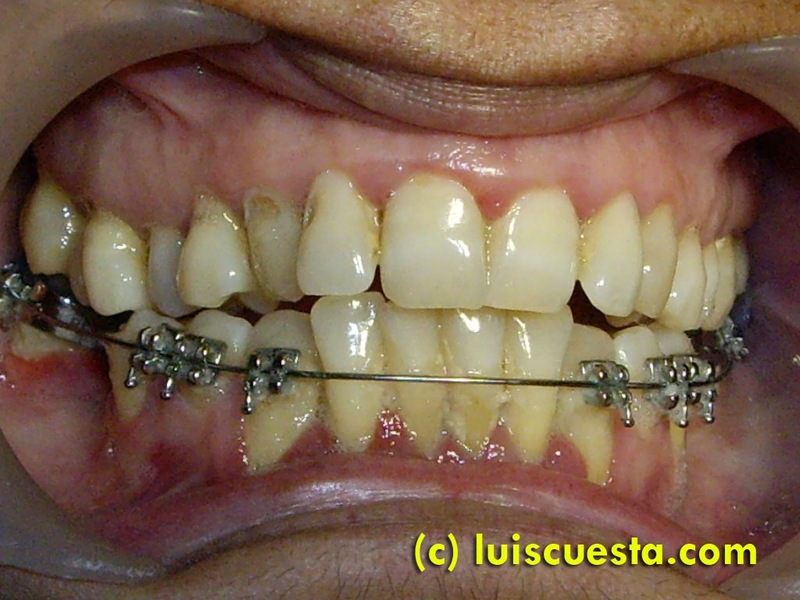 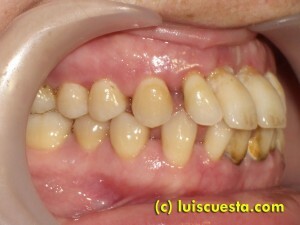 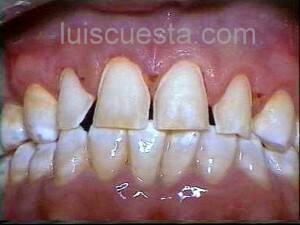 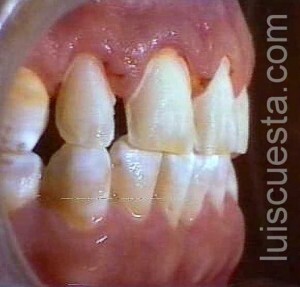 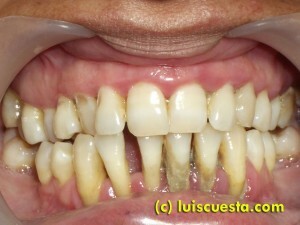 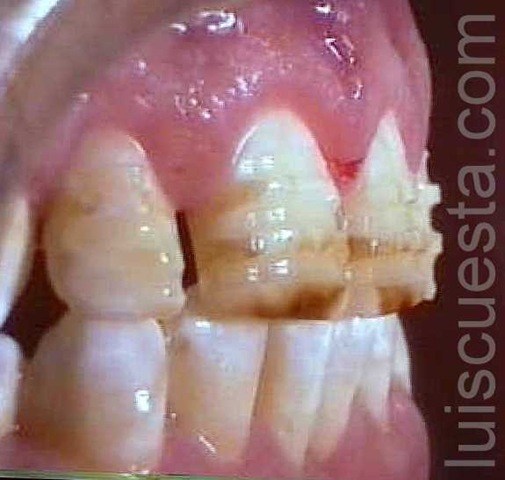 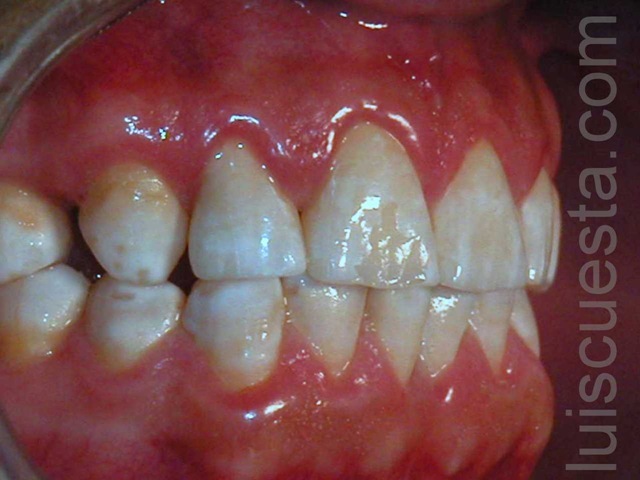 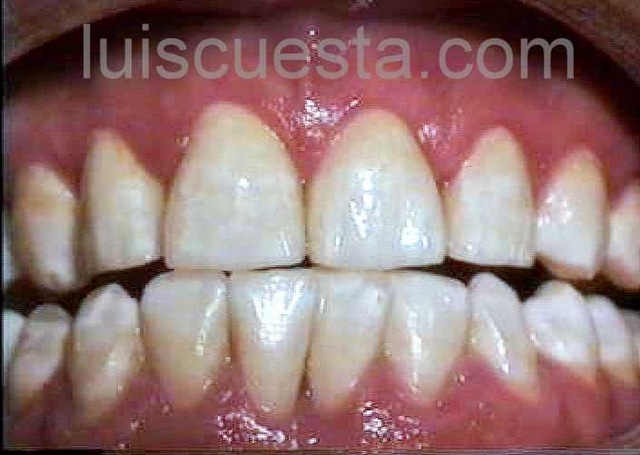 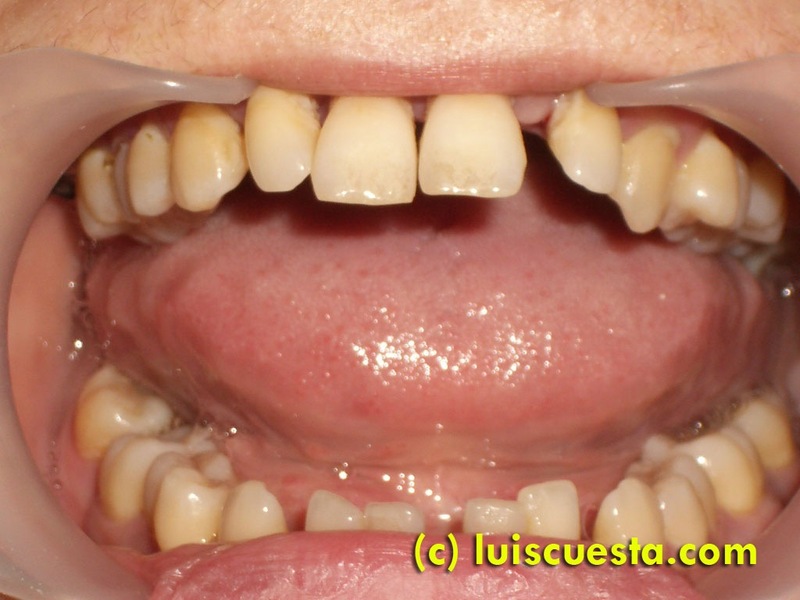 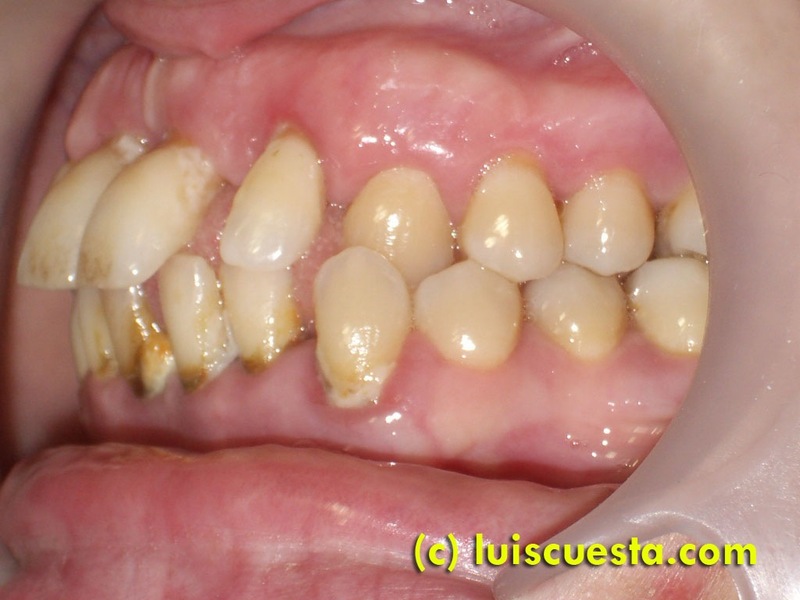 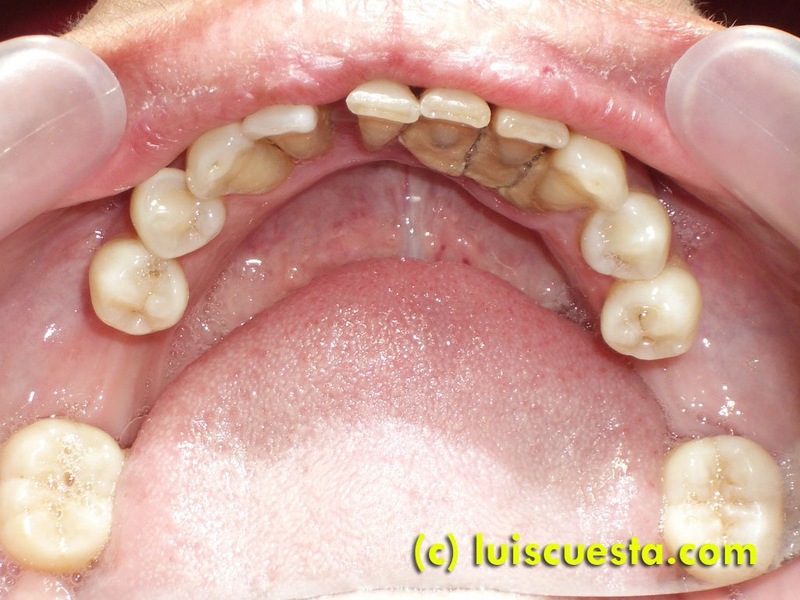 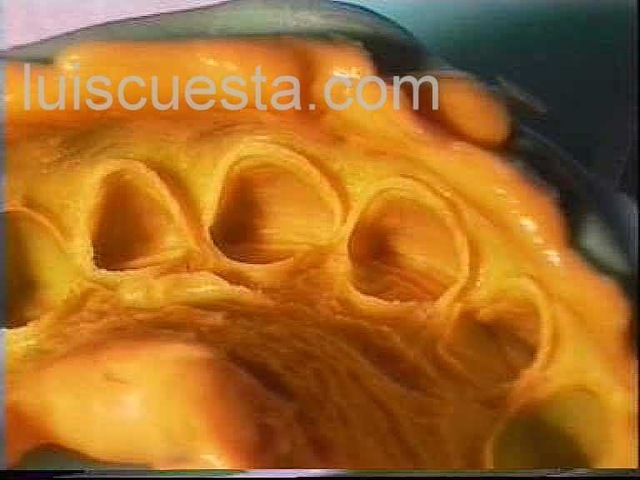 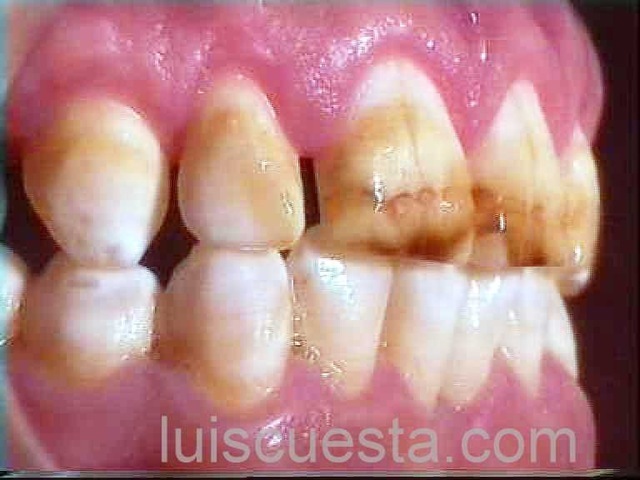 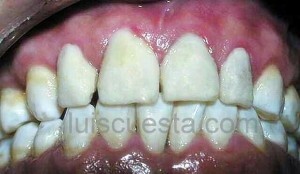 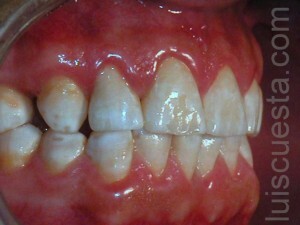 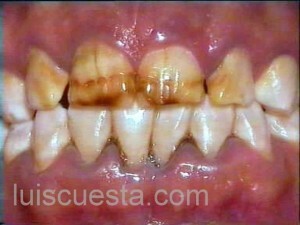 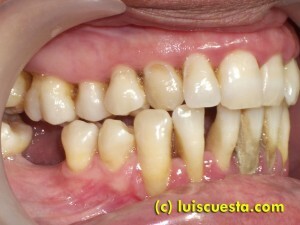 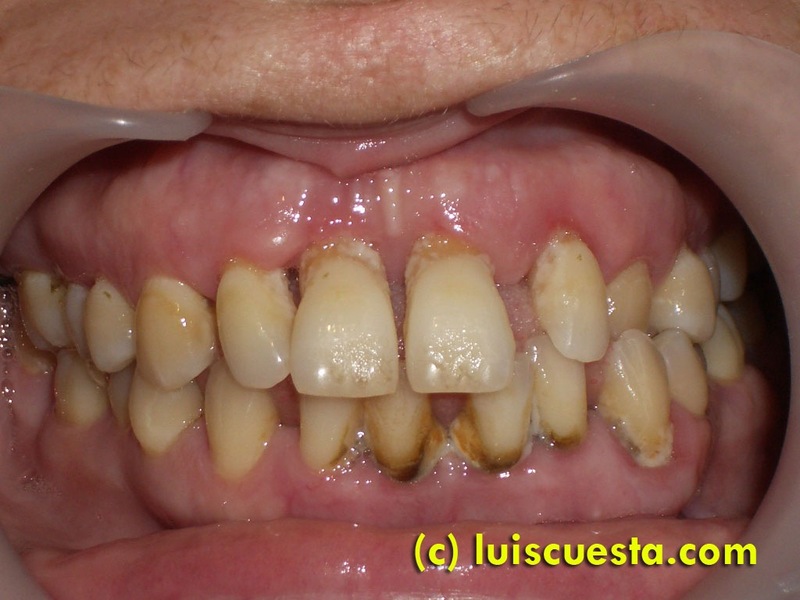 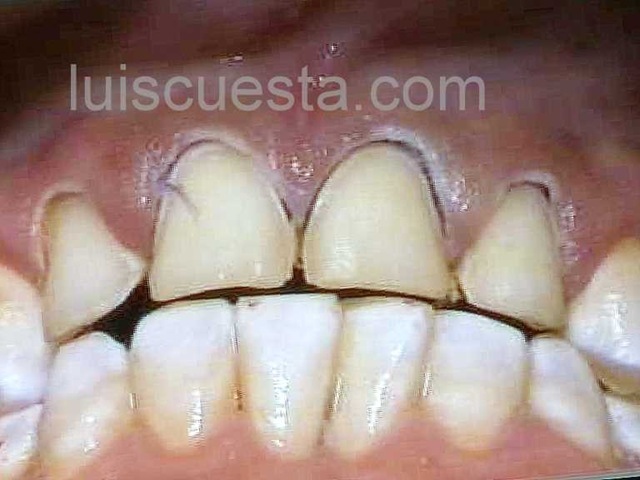 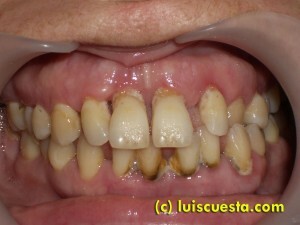 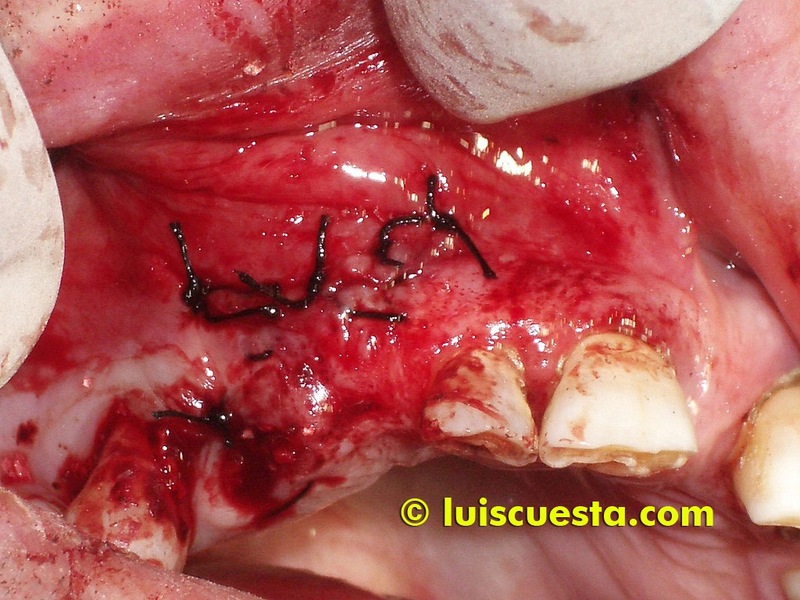 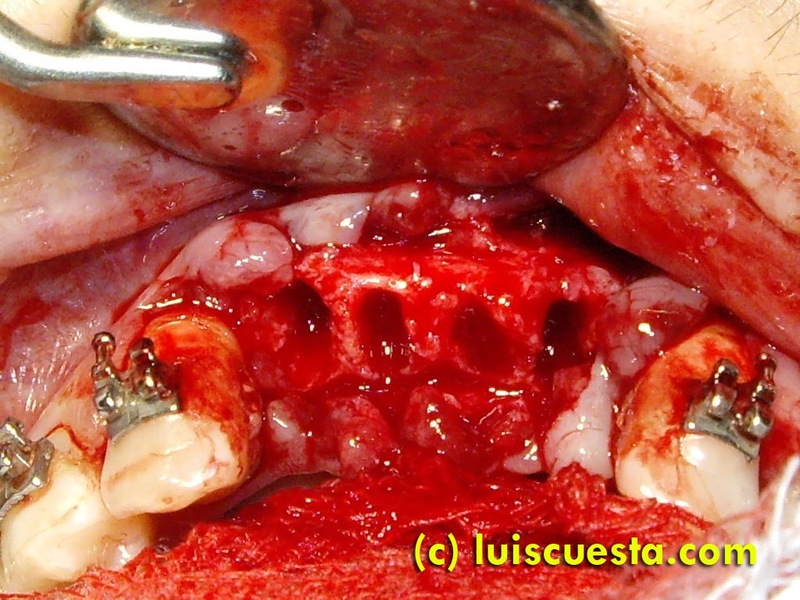 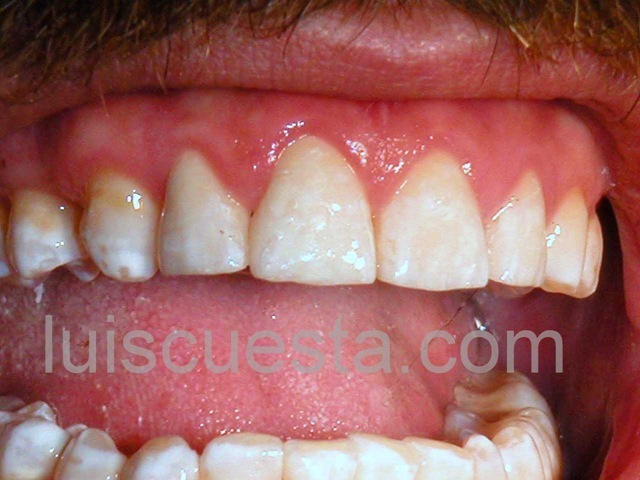 This case presents severe periodontal disease. The only logical treatment plan is full extractions and new denture. 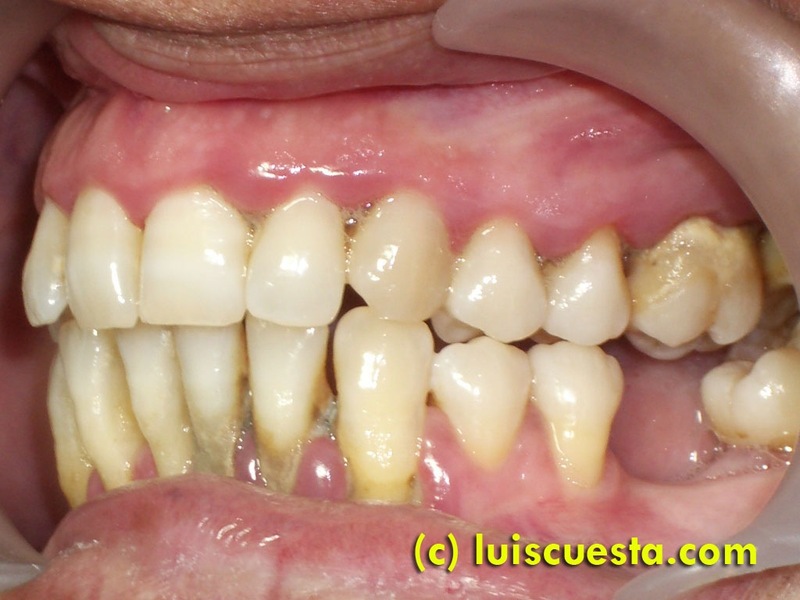 The virulence of the periodontal affection and the severe bone ridge damage, with too many irregularities, suggest a prudential approach for the implant surgery. 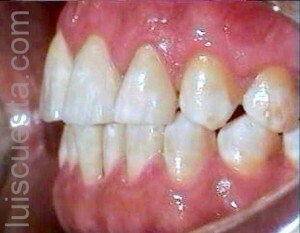 I prefer having the teeth extracted and wait until the bone ridge is in better, safer shape and the bacteria in the mouth have cleared up. 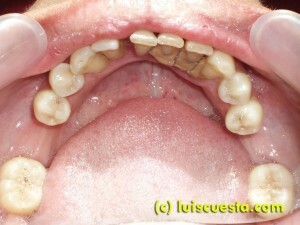 So, the patient is sent to her general dentist for full extractions and temporary denture placement. 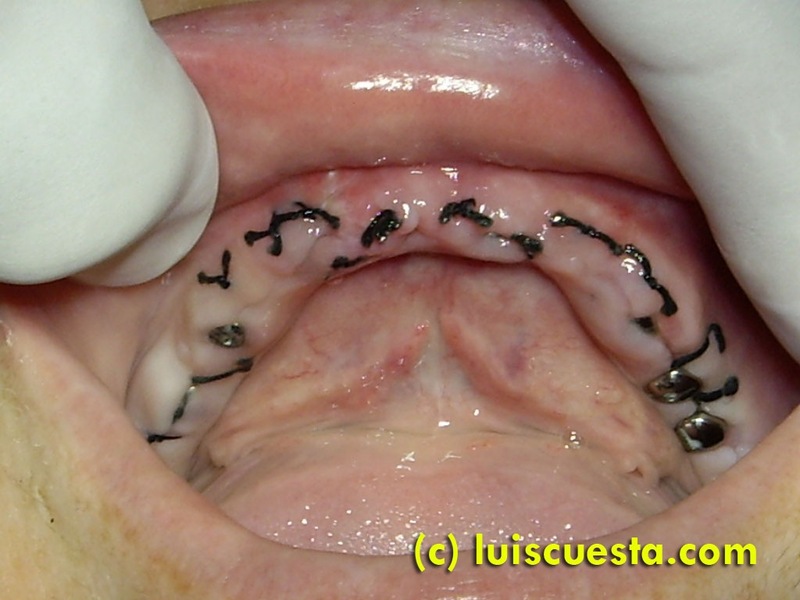 We wait 4 1/2 months, with periodical checks to prevent from a sudden ridge collapse. The longer the wait, the safest the implant surgery (more regular bone and healthier flora), but you have to be ready for an eventual fast bone resorption that may be the signal to program an immediate implant surgery, not to lose much bone height or width. The ridge is amazingly flat, but extremely deceiving for its concavity. 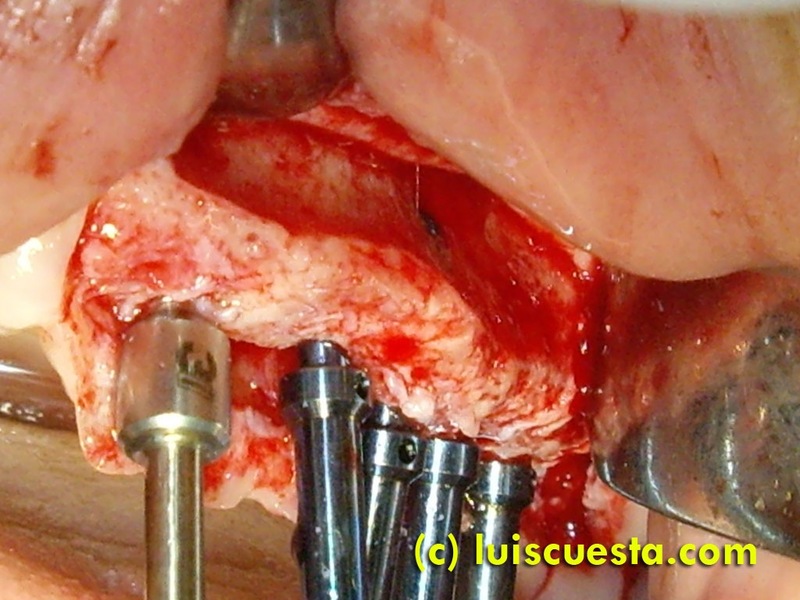 The earlier thrust of a macroglosic tongue left an alveolar protrusion in both maxillas. 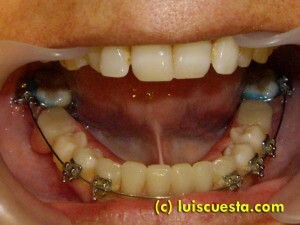 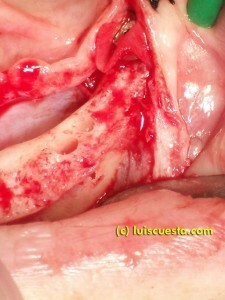 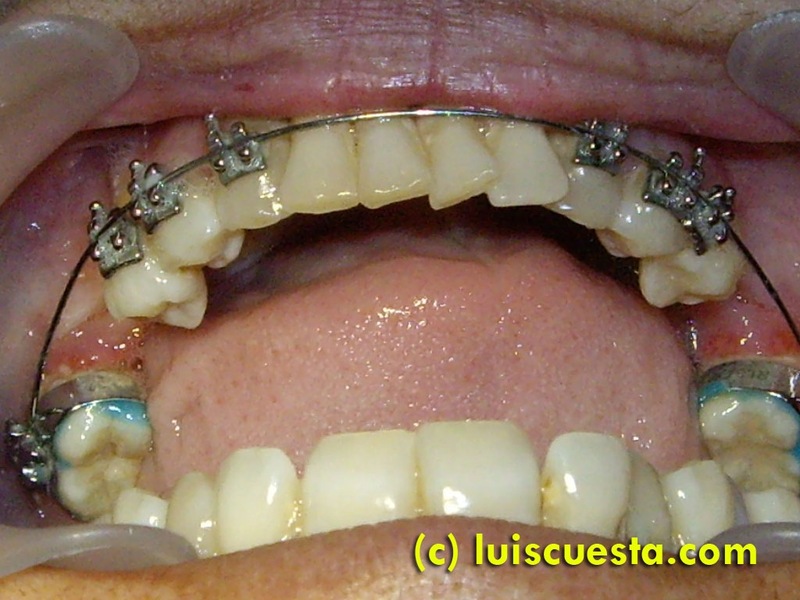 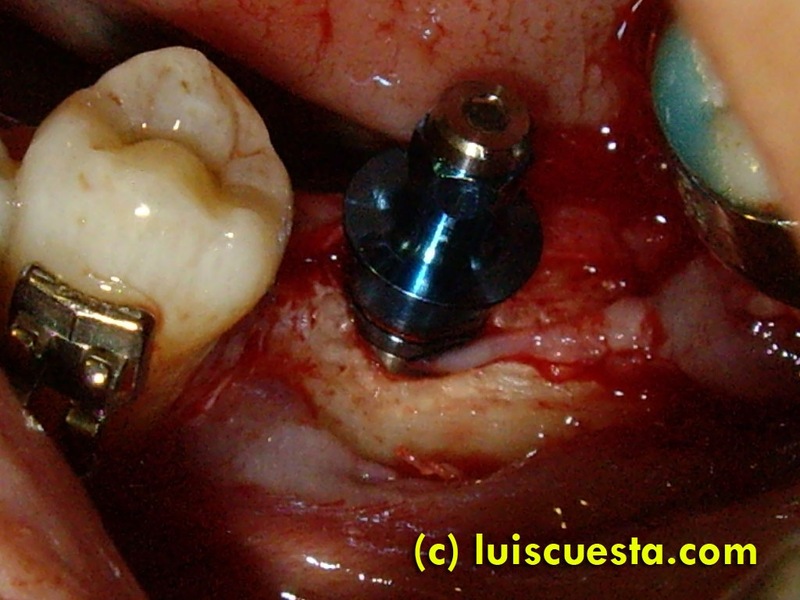 In order to prepare an optimal fitting and esthetic prosthesis. 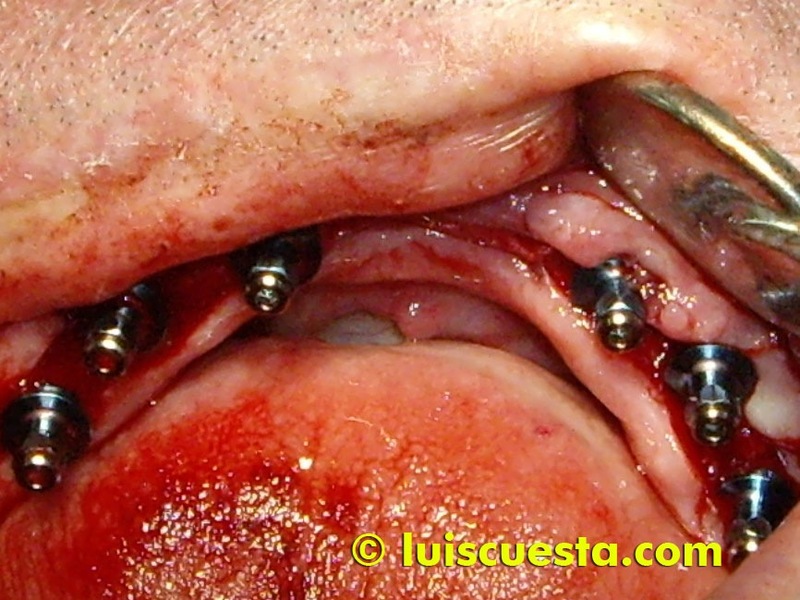 I place the implants as parallel as possible, taking care not to perforate the vestibular bone, but sometimes, it happens. 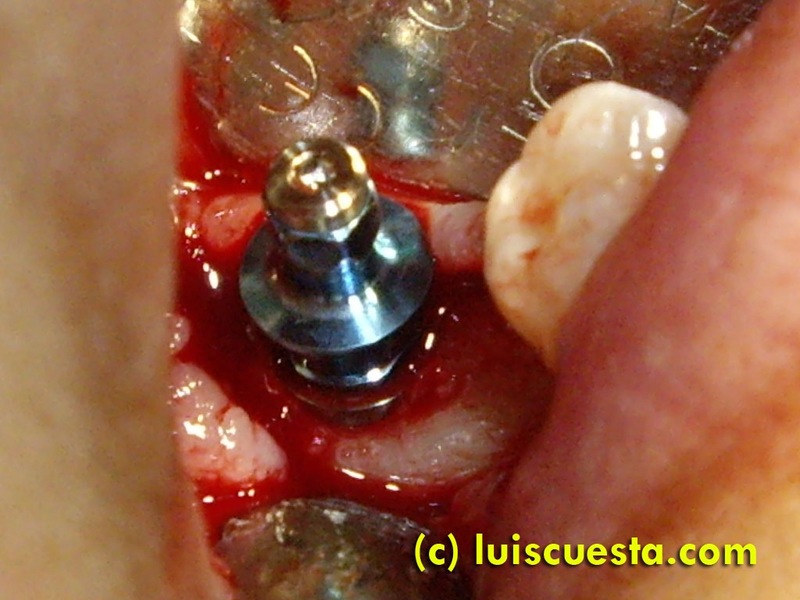 If the space is limited, bone graft and membrane should be used to cover the vestibular defect and still keep the implant in the same place. 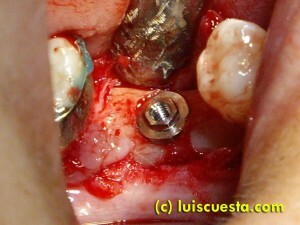 But in this case there is plenty of space to insert the implant somewhere else. 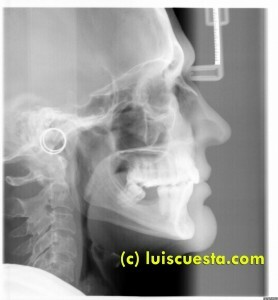 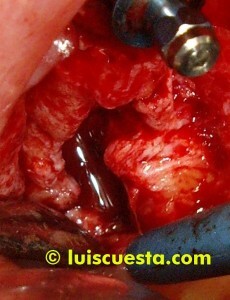 Two weeks later I proceed to the upper maxillary implant surgery. 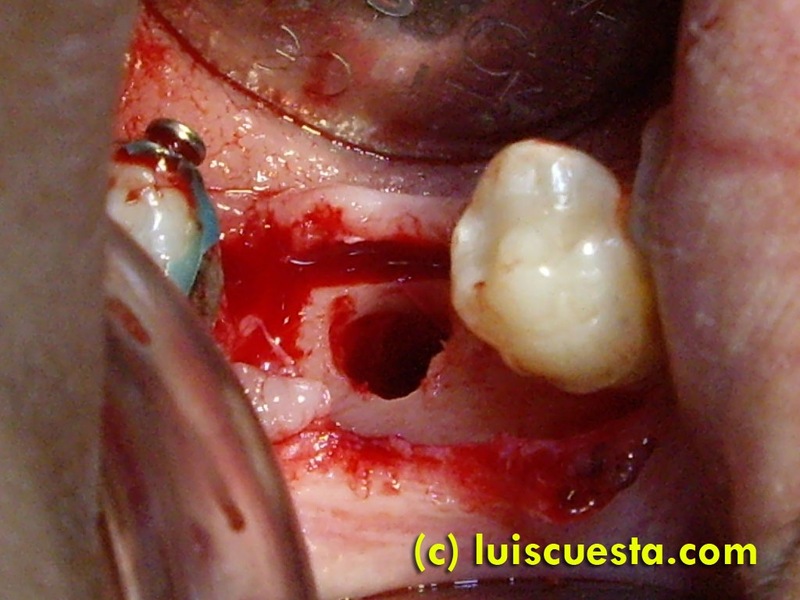 The bone has a more rounded ridge and not as much concavity, but enough as to need a change in placement. 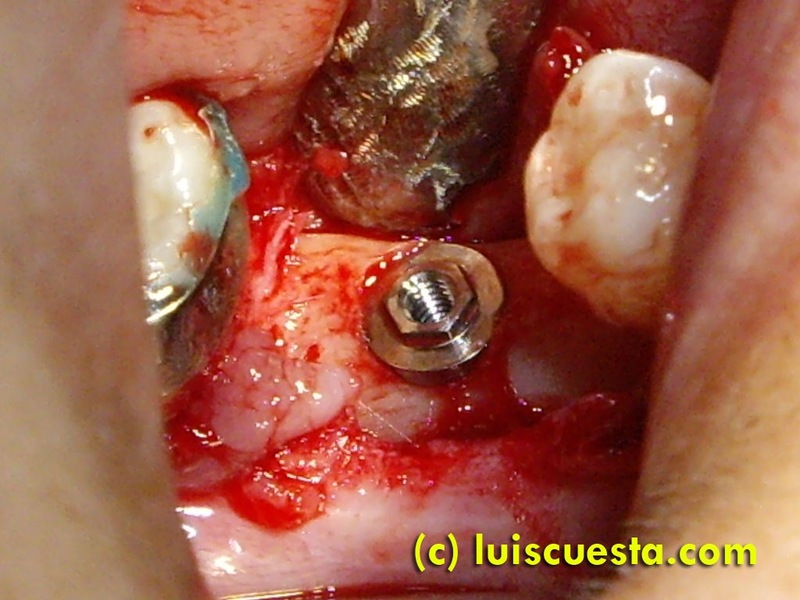 The higher the number of implants, the bigger need for their parallelism. But, the angle that works fine in one bone section may not be as good in another portion of the bone. And perforations can happen. This could be prevented by CAD-CAM designed surgery, but it is also costly. It can be done with a little personal 3D view and surgical resources. 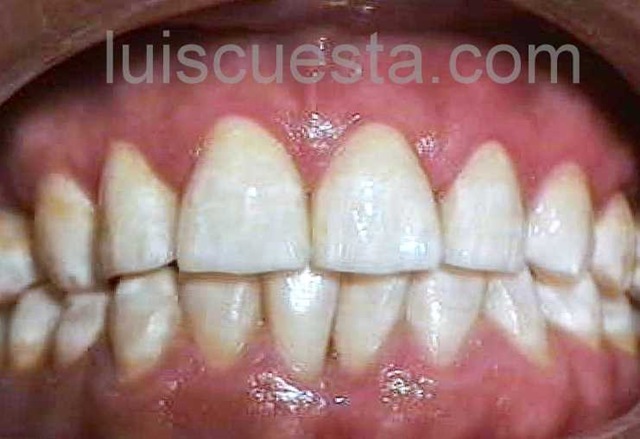 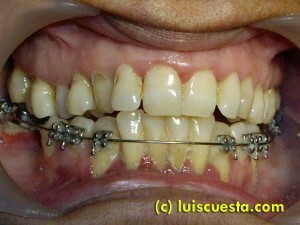 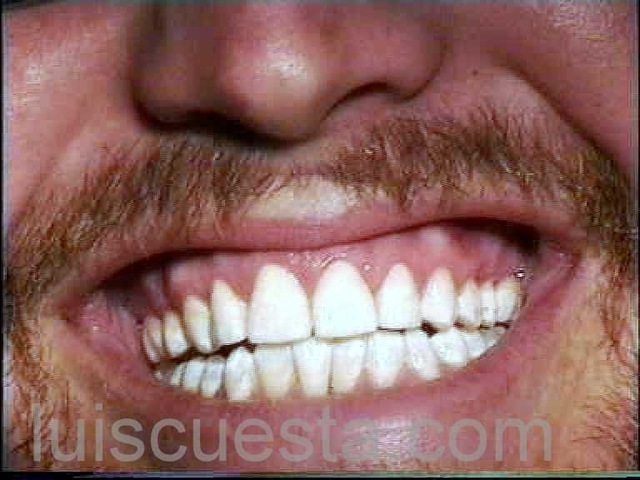 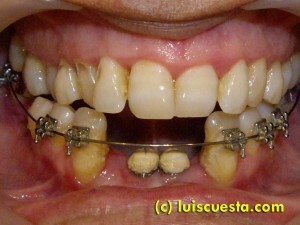 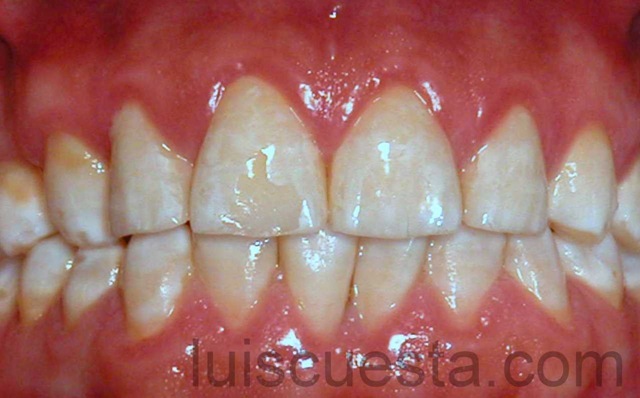 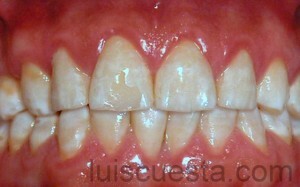 This is the final result after 6 months, ready for his general dentist to initiate the fixed prosthesis. 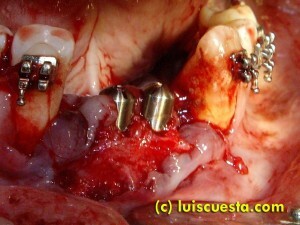 Delayed implants after total extractions. 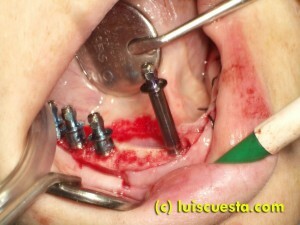 Impacted cuspid extraction. 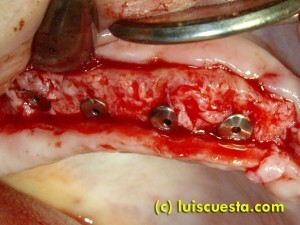 The bone ridge is very damaged and there too many irregularities as to approach immediate implants after extractions. I prefer having the teeth extracted and wait until the bone ridge is in better, safer shape. 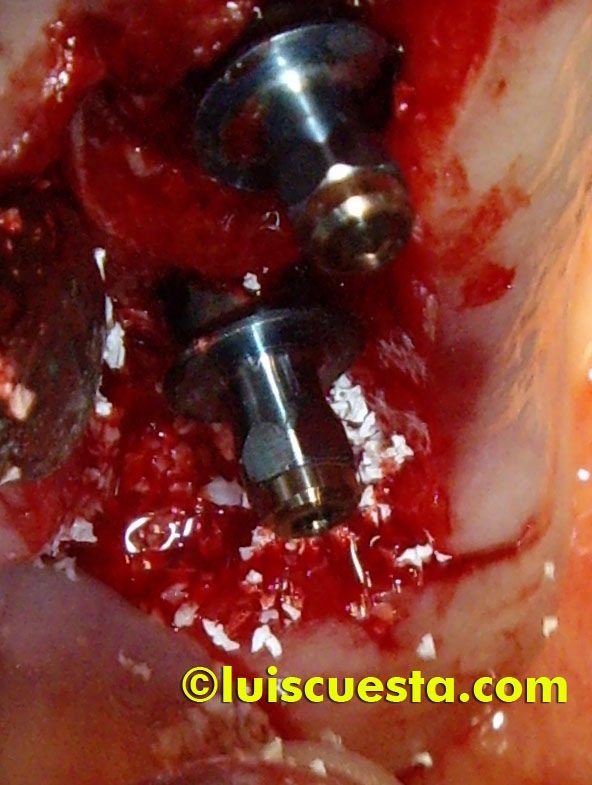 In addition, an impacted upper right cuspid will leave a big hole in the bone in an area that I will need to use for implantation. 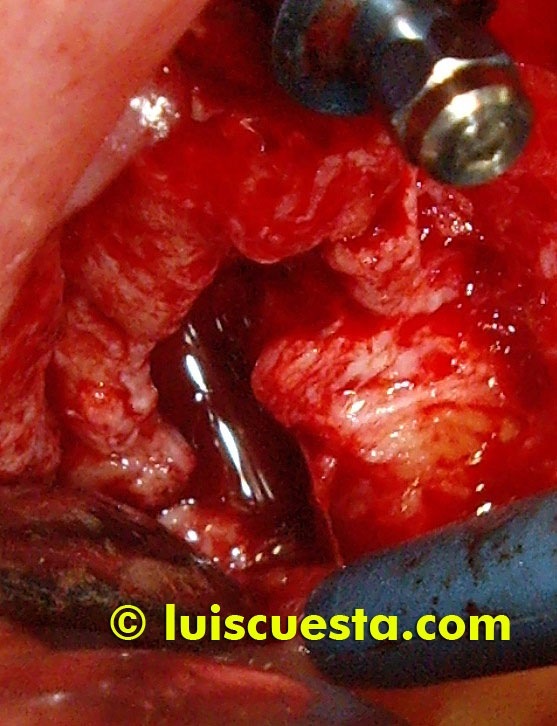 So, I proceed to extract the cuspid and fill the bone defect with Bio-Oss graft, covering it with a resorbable Bio-Guide membrane. Then, all the teeth are extracted by his general dentist, who places a removable denture while waiting for the bone to heal. Then, I place six implants on each jaw. 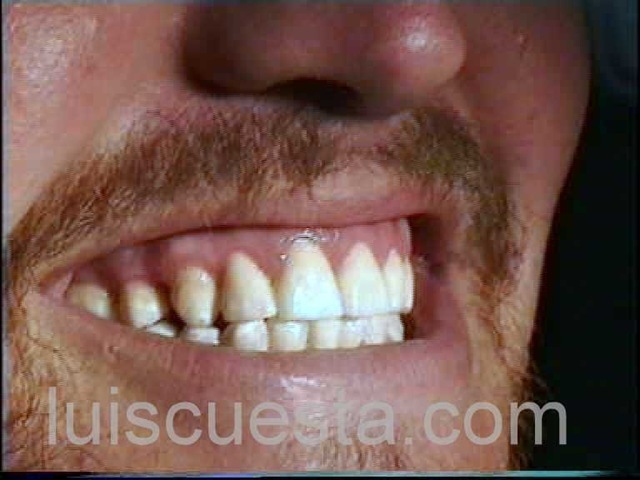 Note the unexpected, deep bone defect that laid after previous extractions of the upper right molars, which was filled up with soft tissue. I use Bio-Oss bone graft and Bio-Guide resorbable membrane to cover the cavity and place the last implant on the front side of the defect.